Warnings about risks in Switzerland’s property market reached fever pitch, with the banking regulator calling for broad measures to curb overheating in buy-to-let real estate. The statement follows months of admonitions from the Swiss National Bank, which has raised red flags about loan-to-value and affordability risks for residential investment properties. The International Monetary Fund added to the warnings this week, saying there was a risk to financial stability. With interest rates at a record low, yield-hungry investors, notably insurance companies and pension funds, have piled into property. 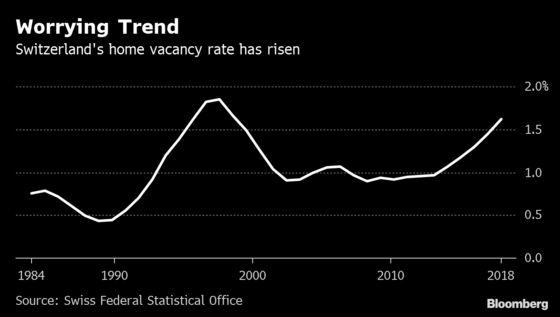 That has boosted construction activity, and the home vacancy rate has hit a two-decade high. The rate is expected to increase further this year, while rents nationally are forecast to decline. “We intervene when individual institutions take on excessive risks, but we believe this is not enough to counteract the generalized overheating trends we are currently seeing,” Finma Chief Executive Officer Mark Branson said on Thursday. He said the problem could only be tackled via changes to regulation or self-regulation. Finma also ordered 11 banks to set aside 4 billion francs ($4 billion) in capital against those risks. Already, the Swiss Finance Ministry has said it will propose increasing risk weights for income-generating real estate. The specifics of the change have not yet been announced. The Swiss Bankers Association has also said it will consider amending its self-regulation for the mortgage market. In previous years, real estate market imbalances have been addressed by industry-led changes to rules on mortgage lending. 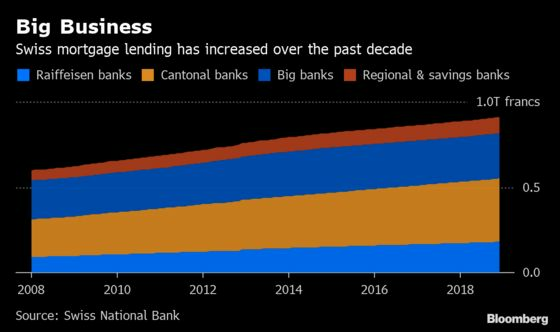 There’s also a countercyclical capital buffer, which ensures that banks’ capital base take into account the macro-financial environment in which they operate, and which could still be increased to boost banks’ resilience. Yet SNB Governing Board Member Andrea Maechler has said it wouldn’t be the most appropriate tool for residential investment property risks.